I got a new phone number last year when I got my iPhone. I chose it because it has my birthday in it, and it spells out the word “ROCK,” which I thought was pretty groovy. Anyway, I apparently made the wrong choice because it appears that my number used to be owned by a drug dealer or some other unsavory character who deemed it necessary to write his number on the wall somewhere, because now I am constantly getting calls from a certain neighborhood in my city. Everyday, they are calling me and each time I scream into the phone that it’s the wrong number. Short of trying to figure out which bathroom stall has the drug dealer’s former number (and my current number) written on it and crossing it out with a Sharpie, there’s really nothing I can do to stop these calls. I could sign up for AT&T SmartLimits for Wireless, which lets you block numbers on your iPhone, but it costs $5 a month. 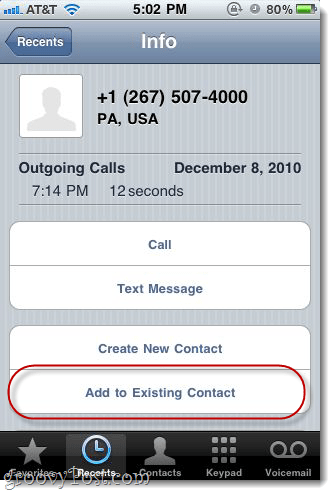 Create a new contact in your iPhone that’s dedicated to nuisance callers—telemarketers, ex-girlfriends, addled drug addicts, etc. You can assign multiple numbers to the same contact. Call it something like “SPAM” or “WRONG NUMBER.” The best way to do this is to pull it up from your recent calls list and hit Add to Existing Contact. Download this silent iPhone ringtone and sync it to your phone. Assign the silent ringtone to your SPAM contact. Now, when that caller calls, your phone will still light up, but you won’t hear anything. Now, this isn’t a true blocked call, which is why I said it’ll only reduce the annoyance factor by 50 percent. The phone will still vibrate when the ringer is off, and it’ll still interrupt your apps and/or music when they call. But it’s better than nothing, and it’s the only free method you can use without jailbreaking your iPhone. I know this isn’t a completely satisfying solution, but until someone makes an app for blocking calls, this is what we’re stuck with. 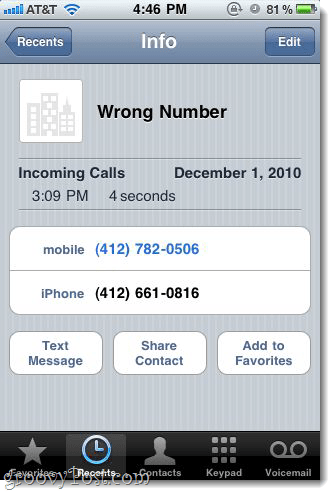 But assigning the wrong number to a specific contact will at least let you know which calls to ignore. In my case, there’s this dude who keeps calling me at least once every two days even though I keep telling him it’s the wrong number. I’ve figured out his name (it’s Jerome) and now I greet him by name each time and tell him to stop calling for the love of God. Or I just pick up the phone and start singing at the top of my lungs. It’s kind of like a reverse crank call. Anyway, if you can figure out a way to disable vibrate for specific iPhone contacts, you win the prize. With that, this solution will be 45 percent better. Note: If you want to prevent unwanted calls from stalkers/exes/telemarketers down the road, I recommend getting a Google Voice account, since you can easily block individual callers with Google Voice. I wanted to try to block some calls on my iPhone, but I can’t find the app for silent rings. Could you give a URL?